As beautiful to watch as they are to drink, Jasmine Pearls slowly unfurl inside the cup, releasing a gentle infusion of jasmine into the air. Made from slender Chinese green tea leaves and dried amongst fresh jasmine blossoms, Jasmine Pearls are hand-rolled to preserve freshness and ensure a high quality cup. Regal and popular, this smooth and subtle cup relaxes and calms the tea drinker. A tea that is grown, harvested, and crafted by a single tea farm. This term is used to distiguish between other products that are a blend of leaves (or other botanicals) harvested from multiple outside tea or herb/spice farms. Green tea is processed just after plucking, which minimizes oxidation and delivers a pale green color and distinct earthy flavor. 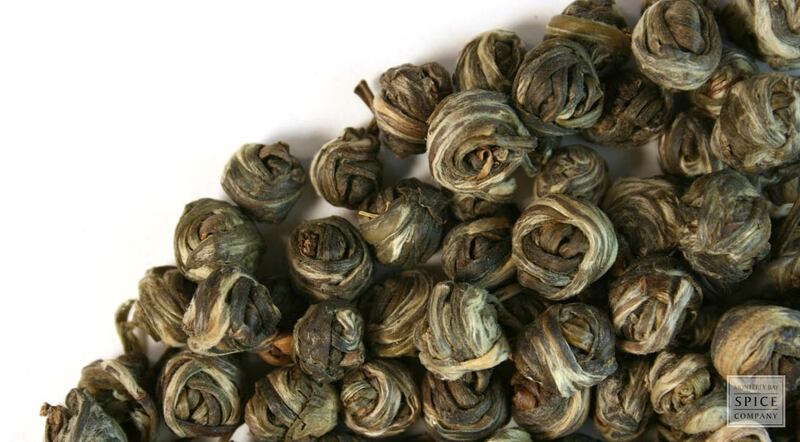 storage tips As with all teas, jasmine pearl tea should be kept in an airtight container away from light and heat. good vs bad Kept in suggested conditions green tea can last 6 months. Please restock often for premium flavor. why buy jasmine pearls tea? infusion method Our jasmine pearl tea is made of hand-rolled green tea that is scented with jasmine blossoms. The blossoms are either layered or mixed with the tea which absorbs the scent of the jasmine flowers and then is separated and re-dried for sale.